In this 40-minute video, Dr. Leigh Kimberg, a Professor of Medicine in the Division of General Internal Medicine at ZSFG/UCSF, works with a breakout session group to understand best practices for screening patients for intimate partner violence (IPV). Please see the attached slide set for definitions and resources. The video starts with prevalence of violence in ZSFG clinics. Dr. Kimberg touches on the goals of addressing IPV, and specifies that disclosure of IPV is not the goal. Rather, goals are: increasing patient safety; increasing patient empowerment; reducing poor health outcomes; and assisting friends, family members, and healthcare employees and others affected by IPV. 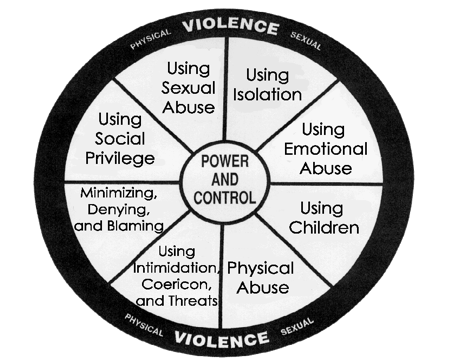 I woud like to suggest that the wheel of violence be used to understand patient-physician interactions. Physicians are well known to wield power and control over patients, many of whom report abusive interactions — but medicine does nothing to acknowledge the problem.